What Might Alien Life Look Like on New 'Water World' Planets? Two newly discovered alien planets might be water worlds whose global oceans are teeming with life, scientists say. The existence of the distant exoplanets, called Kepler-62e and Kepler-62f, was unveiled during a NASA press conference today (April 18). The two worlds are perhaps the most promising life-hosting candidates yet found beyond our solar system, their discoverers said. Computer models suggest both planets are covered by uninterrupted oceans, which could theoretically support a wealth of aquatic lifeforms. 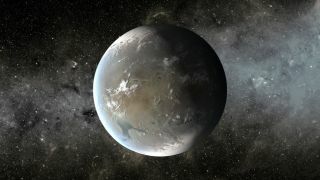 Borucki is science principal investigator of NASA's Kepler space telescope, which spotted Kepler-62e and f. The two alien worlds are 1.6 and 1.4 times bigger than Earth, respectively, and orbit in their star's habitable zone — the just-right range of distances that can support liquid water on a planet's surface. The five-planet Kepler-62 system lies 1,200 light-years away, making it much too distant for current instruments to study in detail. So any talk of potential life on Kepler-62e and f, if it exists at all, is just speculation for now, Borucki stressed. But such speculation is hard to resist. For example, Borucki raised the possibility that the newfound "super-Earths" — worlds just slightly bigger than our own planet — could host winged organisms, even if both planets are indeed water worlds. "At least in our ocean, we have flying fish. They 'fly' to get away from predators," Borucki said. "So we might find that they have evolved — birds — on this ocean planet," he added, referring to Kepler-62e. Water worlds are unlikely to host technologically advanced civilizations like our own, Borucki and other researchers said, because any lifeforms that take root there would not have easy access to electricity or fire for metallurgy. But if Kepler-62e or f has some dry land, Borucki said, the story could be different. The relatively high gravity of both exoplanets, however, might make the evolution of large bipedal organisms such as humans unlikely. "We might not have gotten off four legs" if our ancestors had evolved on Kepler-62e or f, Borucki said. Still, the gravity isn't too oppressive; we'd be able to walk around on Kepler-62f's surface if transported there today, he added. We'd have to take some special life-support gear if we made that 1,200-light-year journey. While Kepler-62e is likely hot and muggy all the way up to the polar regions, Kepler-62f orbits a bit farther away from the host star and is probably cooler. In fact, a thick atmosphere with lots of heat-trapping carbon dioxide may be required to keep Kepler-62f's surface water liquid. Such an atmosphere would be tough for humans to handle. "If you want to write a science-fiction story, and you land on both [planets], at least be sure that on f you don't want to take your mask thingy off," said modeling-study lead author Lisa Kaltenegger, of the Max Planck Institute for Astronomy and the Harvard-Smithsonian Center for Astrophysics. Kepler-62e and f are part of a trove of seven newfound planets announced today. Kepler spotted three other planets in the Kepler-62 system as well, all of them too hot to support life. The other two worlds are in the Kepler-69 system, which lies about 2,700 light-years from Earth. The newly discovered Kepler-69c, which is 1.7 times larger than Earth, may also be capable of supporting life, researchers said.